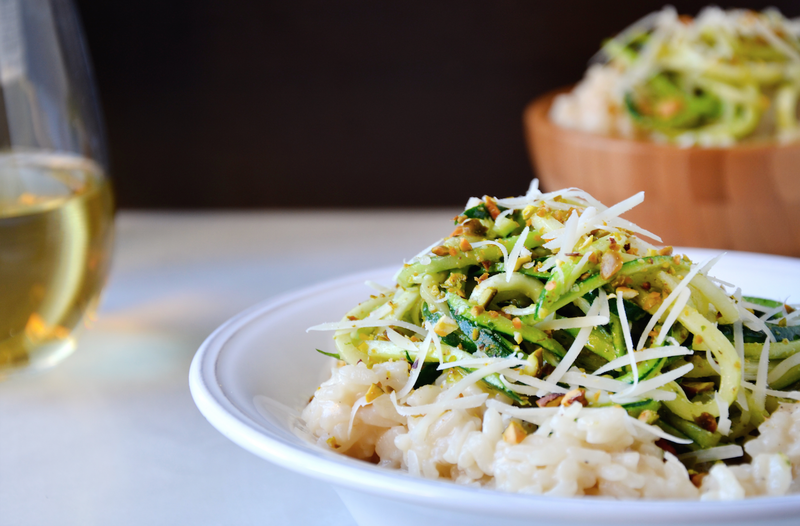 Creamy Parmesan risotto, garlicky zucchini noodles and toasted pistachio pesto join forces for a gourmet take on comfort food that’s quick enough to whip up on weeknights and impressive enough to serve at special events. Best of all, risotto can finally ditch its reputation for being one of the most laborious dishes to prepare. 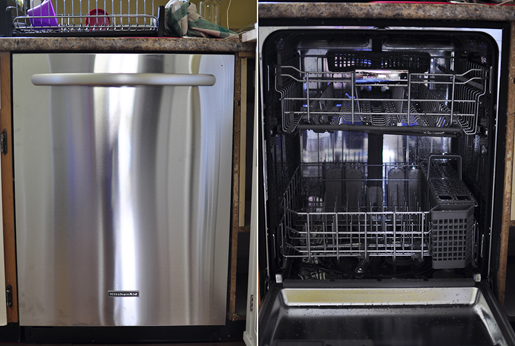 And it’s all thanks to the KitchenAid® Multi-Cooker with Stir Tower, which takes the stress (and stirring!) out of preparing this cheesy Italian favorite. The KitchenAid® Multi-Cooker has more than 10 cooking methods, which gives you the flexibility to cook everything from scrambled eggs and stir-fry to chocolate fondue and cheesecake. For this recipe, you’ll select the Risotto setting on the Multi-Cooker and then follow the clear and concise steps, beginning with the Sauté step, which quickly and consistently browns the garlic and shallots in the butter. 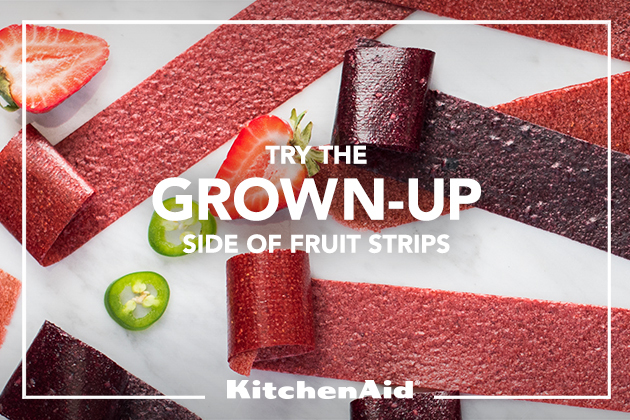 By attaching the KitchenAid® Stir Tower, you’re eliminating the need to stand over the stove for 20 minutes, as it’ll stir the ingredients to ensure they’re evenly cooked. 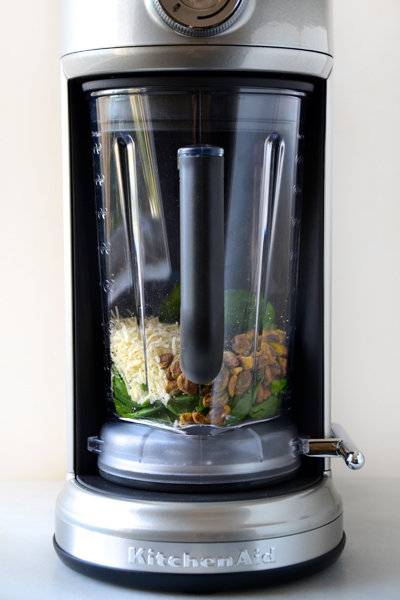 You can choose from a variety of speed and time settings to customize exactly how the Stir Tower functions. After you’ve sautéed the garlic and shallots, add the wine and then the rice. Let the Stir Tower work its magic as you add the warmed chicken stock in increments to the Multi-Cooker. 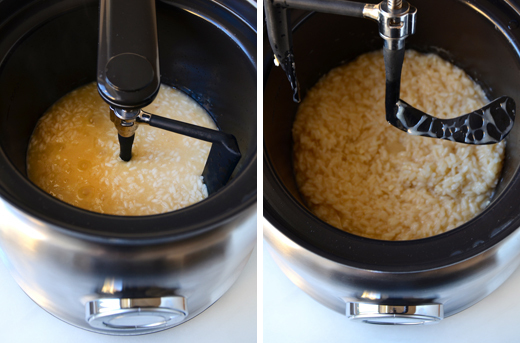 Less than 20 minutes later, you’ll have the creamiest, cheesiest risotto. Adjust the Multi-Cooker to the Warming setting while you prepare the pesto and zucchini noodles. Next up is the pistachio pesto, which you can whip together in seconds with the KitchenAid® Torrent™ Blender. 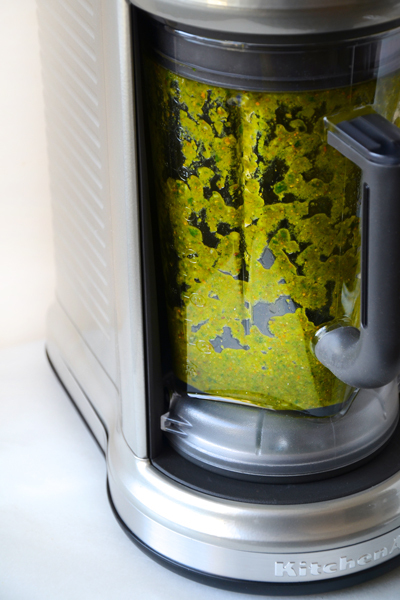 Simply add the pesto ingredients to the blender, pop it into the secure blender base, and then with the blender running, stream in the olive oil. The result is extra-creamy, flavor-packed pesto perfect for pairing with zucchini noodles made with the KitchenAid® Spiralizer Attachment, which fits onto any size KitchenAid® Stand Mixer. 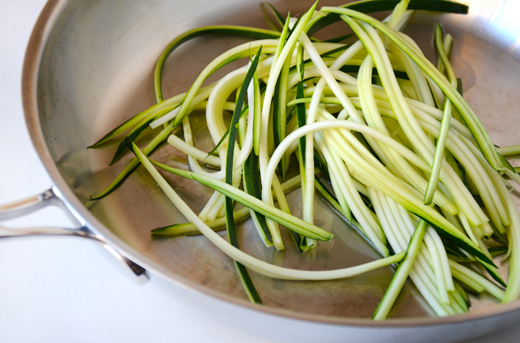 After spiralizing the zucchini, sauté the noodles quickly with a splash of olive oil. The noodles will cook in less than 2 minutes. 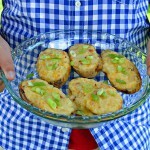 It’s important not to overcook them in order to retain a bit of a bite. Next up, toss the noodles with the pistachio pesto until they’re well coated. Then it’s time to assemble the dish, starting with a hearty helping of the warm, creamy risotto topped with the zucchini noodles. A final sprinkle of Parmesan cheese and chopped pistachios completes this easy but impressive meat-free meal in a bowl. Add the chicken stock to a medium saucepan set over medium heat. Bring it to a simmer then cover it with a lid and remove it from the heat. 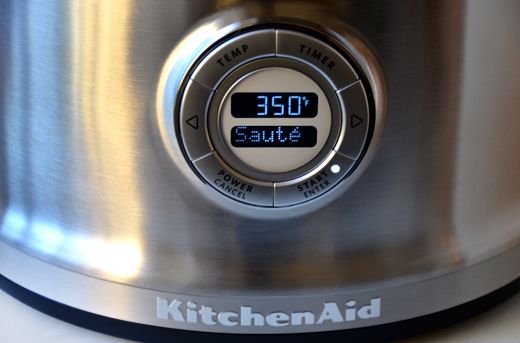 Set the KitchenAid® Multi-Cooker to the Risotto setting and attach the KitchenAid® Stir Tower. Add the butter to the cooker. Once the butter melts, add the minced garlic and shallots then cover the cooker and turn on the Stir Tower to the LOW setting. Cook, while the Stir Tower stirs the ingredients, for 1 minute. Add the rice, salt and pepper, and cook covered with the Stir Tower on LOW for 2 minutes. Add the wine and cook covered with the Stir Tower on LOW for 2 minutes. Select Risotto/Step 2 on the Multi-Cooker. Add 1/2 cup of the warm chicken stock and cook, covered with the Stir Tower on LOW, until the stock is absorbed. Continue adding 1 cup of the warm stock at a time and allowing it to cook and absorb while the Stir Tower stirs the risotto until you’ve added all of the stock and it’s all absorbed. 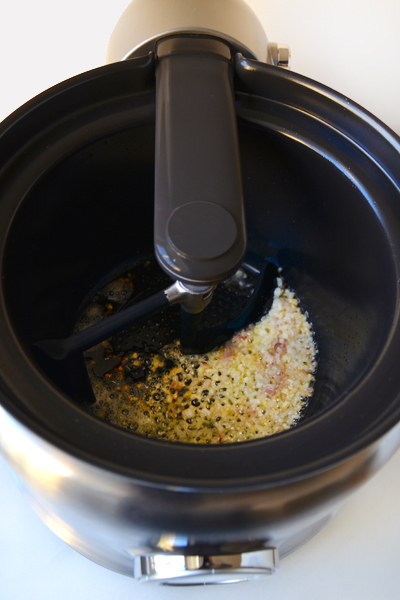 Remove the Stir Tower, turn the Multi-Cooker to warm and stir in the Parmesan cheese. Keep the risotto covered while you prepare the zucchini noodles and pesto. 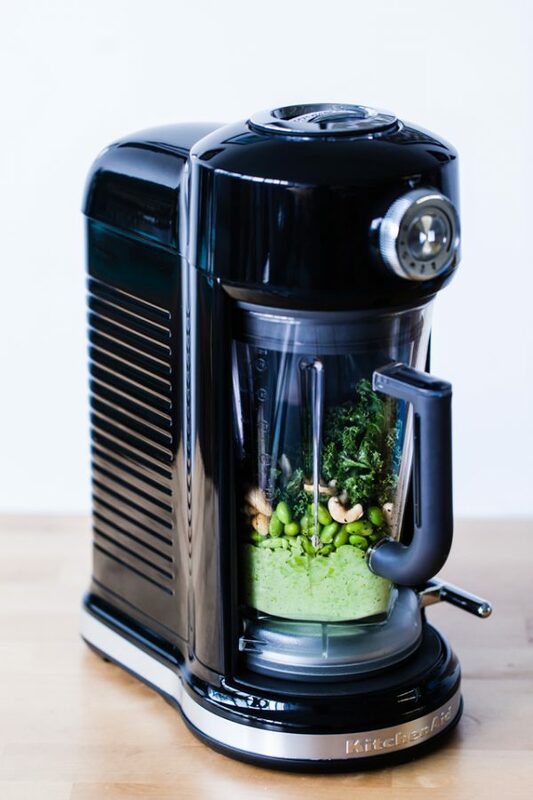 Add the pistachios, basil leaves, Parmesan, garlic, salt and pepper to the KitchenAid® Torrent™ Blender. Blend the ingredients for 10 to 15 seconds, then with the blender still running, slowly stream in the olive oil until it’s fully incorporated and the mixture is well-blended, scraping down the sides as needed. Transfer the pesto to a bowl and season it with salt and pepper to taste. Attach the KitchenAid® Spiralizer Attachment to the Stand Mixer. Then affix the zucchini to the fruit and vegetable skewer and install the blade. Turn the Stand Mixer to speed 4 to produce noodles. Add 1 tablespoon olive oil to a large sauté pan. Add the zucchini noodles and cook, tossing, for 2 minutes just until wilted. Transfer the zucchini noodles to a large bowl, add a portion of the pesto and toss to combine. 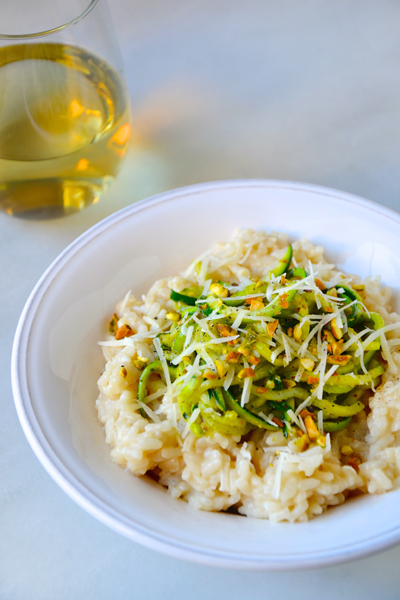 Serve the risotto topped with the zucchini noodles and a sprinkle of Parmesan cheese.